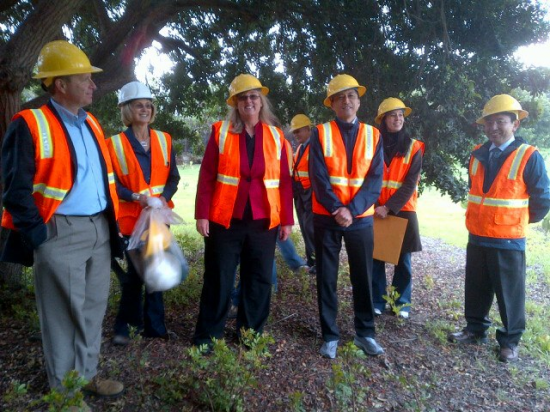 Taking shelter from the rain during a tour of Historic Wintersburg (from left): Doug Erber, president of Japan America Society of Southern California; Sue Gordon, Rainbow Environmental Services; Huntington Beach Mayor Connie Boardman; Consul General Jun Niimi; Consul Advisor Jennifer Uysak; and Consul Toshio Odagiri. HUNTINGTON BEACH — Jun Niimi, consul general of Japan in Los Angeles, and other dignitaries were given a tour of Historic Wintersburg in Huntington Beach on Feb. 8. The tour was organized by the Historic Wintersburg Preservation Task Force, which is dedicated to the preservation of century-old historic structures in the former Wintersburg Village. The five-acre site represents the sole remaining property owned by a Japanese family prior to 1913, which fostered some of Orange County’s founding families. The structures include the Furuta family barn (1904-1909), Wintersburg Japanese Presbyterian Mission (1910), Furuta family home (1912), and Wintersburg Japanese Presbyterian Church (1934). Niimi, who was accompanied by Consul Toshio Odagiri and advisor Jennifer Uysak, remarked that he was touched by the hard work and perseverance represented by the Furuta farm and Presbyterian mission complex. Also taking part in the tour were Huntington Beach Mayor Connie Boardman, Japan America Society of Southern California President Doug Erber, Sue Gordon of Rainbow Environmental Services, Orange County Japanese American Association President Dr. Jack Naito, and Akemi Miyake of OCJAA. The Huntington Beach Planning Commission will review the Historic Wintersburg (Warner-Nichols) draft environmental impact report at a study session on Tuesday, March 12, at 5 p.m. and a public hearing on Tuesday, March 26, at 7 p.m. In preparation for the review, Commissioners Dan Kalmick, Connie Mandic and Edward Pinchiff visited the site on Feb. 11. Those who wish to send letters before the study session starts can send them to: Planning Commission, City of Huntington Beach, 2000 Main St., Huntington Beach, CA 92648. For more information, visit the task force’s Facebook page or www.HistoricWintersburg.blogspot.com. The Wintersburg Japanese Presbyterian Mission building in 2012. Thank you Rafu Shimpo for sharing our information! 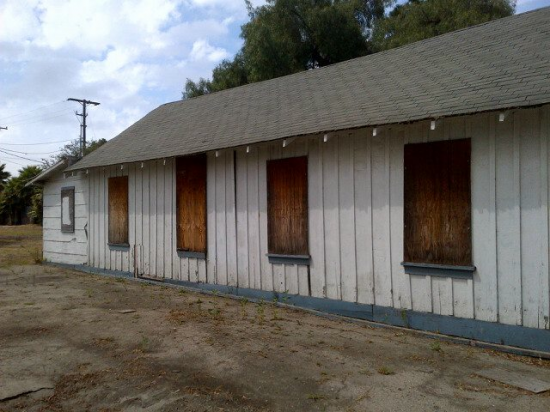 Readers who would like more information about the history of Historic Wintersburg in Huntington Beach (Orange County) can go to http://www.HistoricWintersburg.blogspot.com. Please join our Facebook page as mentioned in the article to stay up-to-date on the current environmental process and our effort to preserve this precious Japanese pioneer property. Public support is needed to save this historically significant property from demolition.